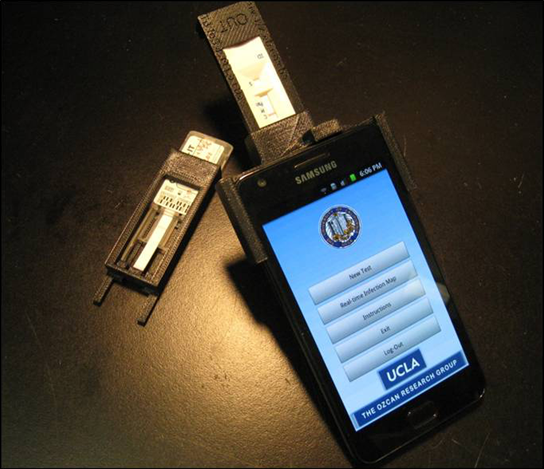 In an effort to increase global awareness and to better detect signs of infectious diseases around the world, engineers at UCLA have developed a compact and cost-effective RDT-reading device that works in tandem with standard cell phones. “Conventional RDTs are currently read manually, by eye, which is prone to error, especially if various different types of tests are being used by the health care worker,” said Aydogan Ozcan, a UCLA professor of electrical engineering and bioengineering. “What we have created is a digital ‘universal’ reader for all RDTs, without any manual decision-making,” he said. The RDT-reader attachment, which clips onto a cell phone, weighs approximately 65 grams and includes an inexpensive lens, three LED arrays and two AAA batteries. The platform has the ability to read nearly every type of RDT. An RDT strip is inserted into the attachment, and with the help of cell phone’s existing camera unit and a special smart-phone application, the strip is converted into a digital image. The platform then rapidly reads the digitized RTD image to determine, first, whether the test is valid and, second, whether the results are positive or negative, thus eliminating the potential errors that can occur with a human reader, especially one administering multiple tests of various test types. And because the color changes in RDTs don’t last more than a few hours in the field, the ability to store the digitized image indefinitely provides an added benefit. “This platform would be quite useful for global health professionals, as well as for policymakers, to understand cause–effect relationships at a much larger scale for combating infectious diseases,” Ozcan said. Funding for the Ozcan Research Group is provided by the Presidential Early Career Award for Scientists and Engineers (PECASE), the ARO Young Investigator Award, the National Science Foundation CAREER Award (BISH program), the ONR Young Investigator Award, and the National Institutes of Health Director’s New Innovator Award. 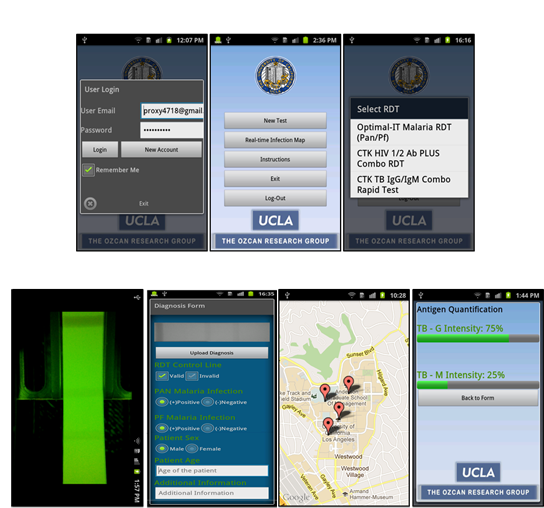 Be the first to comment on "RDT-Reader Attachment Works With Cell Phone"